Location in Scotland County and the state of North Carolina. In 1840, Laurinburg had a saloon, a store, and a few shacks. Laurinburgh High School, a private school, was established in 1852. The settlement prospered in the years following. A line of the Wilmington, Charlotte and Rutherford Railroad was built through Laurinburg in the 1850s, with the first train reaching Laurinburg in 1861. The railroad's shops were moved to Laurinburg in 1865 in the hope they would be safer from Union Army attack; however, in March of that year, Union forces reached Laurinburg and burned the railroad depot and temporary shops. Laurinburg was incorporated in 1877, and the first courthouse in Scotland County was erected in Laurinburg in 1901. A new courthouse was built in 1964. In 1904, a black preparatory school called the Laurinburg Institute was founded. Main Street in Laurinburg was paved in 1914. According to the United States Census Bureau, the city has a total area of 12.6 square miles (33 km2), of which 12.4 square miles (32.1 km²) is land and 0.2 square miles (0.52 km2) (1.27%) is water. In the city, the population was spread out with 26.6% under the age of 18, 10.7% from 18 to 24, 25.9% from 25 to 44, 22.7% from 45 to 64, and 14.1% who were 65 years of age or older. The median age was 36 years. For every 100 females, there were 81.2 males. For every 100 females age 18 and over, there were 74.7 males. The state Scotland Correctional Institution, located near the airport, opened in 2003. The city is home to St. Andrews University, formerly known as St. Andrews Presbyterian College. The local radio station is WLNC. ^ a b c d e f Myers, Betty P. "History". City of Laurinburg, NC. Retrieved July 27, 2017. ^ a b "Mayor". City of Laurinburg, NC. Retrieved July 27, 2017. ^ Barrett, John G. (1995). The Civil War in North Carolina. University of North Carolina. p. 300. ^ Marks, Stuart A. (1991). Southern Hunting in Black and White: Nature, History, and Ritual in a Carolina Community. Princeton University Press. p. 9. 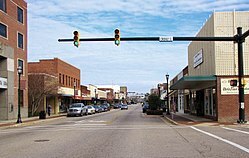 Graham, Gael, "'The Lexington of White Supremacy': School and Local Politics in Late-Nineteenth-Century Laurinburg, North Carolina," North Carolina Historical Review, 89 (Jan. 2012), 27–58.